In order to understand the world and the endless amount of information we take in every second, the human brain has developed the use of ‘schemata’, or categories, which are used as frameworks so that information can be easily and quickly filed away to help us interact appropriately in different situations. Everyone has their own set of schemata influenced by background, upbringing, experiences and relationships. Yet, there is no doubt that everyone uses them. They have to, as some scholars say, or else we would constantly be in information overloads and no interaction would be able to take place. Some schemata are shared by the general populous, such as gender schemata. The female schema contains characteristics such as nurturing, facilitating, polite, dependent, and unaggressive. The male schema says men are dominant, aggressive, stoic, successful, independent, and the breadwinners. There are also other schemata that go along with race/ethnicity, class, religion, occupation, national identity, and sexuality. These universally accepted schemata can be easily discovered by simply looking at the media and advertisement portrayals and how they represent their markets. It seems that Dockers has very different schemata traits when it comes to gay and straight men, which we can see in their most recent advertising campaign. This campaign began in early December of 2009 which called for men to go back to their roots, to act more manly, and to ‘Wear the Pants’. Most of the ads have the same general format; a man standing in front of a plain background, the top half of him is a saying and he is wearing Dockers pants. What is interesting is the difference in the word choice given the context the ad will be seen. Can you guess which one of the above ads I found in Out magazine, the world’s leading gay fashion and lifestyle magazine? Without getting into the phrases used, you could probably tell just by the style and fit of the pants. The ones on the left are an orange/pink and the fit is much tighter than the khaki’s on the right which are looser, wrinklier, and a dull tan. Even the stance of the two are remarkably different. We have one who is almost posing sexually, looking to the side, or behind him as if looking for someone to make a connection with, versus the other man who seems to have no interest in what is going on around him. Rather, he is looking out with his hands on his hips as if he just accomplished a trying task or is contemplating the meaning of life. Getting down to the more obvious of differences, we see what the Dockers advertising campaign sees as the difference in priorities between gay men and straight men through the phrases they chose to make up the body (in both sense of the word) of the ads. ‘Behold the Second Dawn of Man’ goes along with the main theme of the Dockers new ad campaign which, in summary, claims that our society has become “genderless”, and is therefore crumbling. It calls for men to drop their non-fat lattes, put on their pants, be men and help little old ladies cross the street, discipline misbehaving children, and of course, buy Docker’s pants. It is easy to see the sexism in this campaign, but further drudging of the advertisements brings to light more prejudice ideals. First of all, the ad I found in Out is much harder to track down in other outlets. In fact, it doesn’t even appear in a Google search. 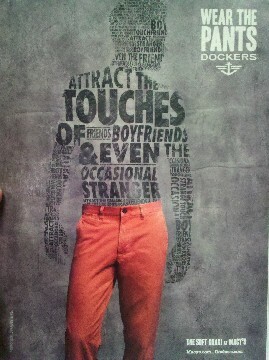 Does Dockers not want to be identified with the gay community,? if so, why advertise in a gay magazine? It is important to understand the implications and affects these representations have on our culture, from creating unfair homogenous stereotypes of a group to instilling an unattainable body and lifestyle ideal people subconsciously try to obtain through consumerism and other life choices. This entry was posted in Fashion Research and tagged Advertising, consumer culture, cultural studies, Dockers, Pop Culture, Queer Fashion. Bookmark the permalink.